Be thorough when researching or choosing things like travel insurance or vaccinations and medications to take with you on your travels. It’ll save you a lot of personal and financial stress if anything ever happened abroad. When you go traveling, whether it’s long-term or short-term, there are some things to take into consideration before you board the airplane. Every trip I go on, I make a checklist of all the little things I need to do before I leave. Below I’ve shared my list with you so you can make sure you have all your bases covered before you head out on your next vacation. I don’t care where you’re going, or for how long, you need to make sure you have travel insurance. One tiny little accident, or an unexpected health problem could end up costing you thousands of dollars that you don’t have, so make sure you have travel insurance while you’re gone. Photocopy all the important things in your wallet you’re taking with you, along with your passport, flight information and itinerary. Keep a copy or two in your luggage and leave a copy with someone back at home so they have all your information as well in case your wallet is lost or stolen. Call your bank and let them know you’re traveling. I’ve met so many people who have had their accounts frozen while traveling because their bank thought something fraudulent was going on. You can even go online these days and fill out a form with your travel information so you don’t have to call someone about it. 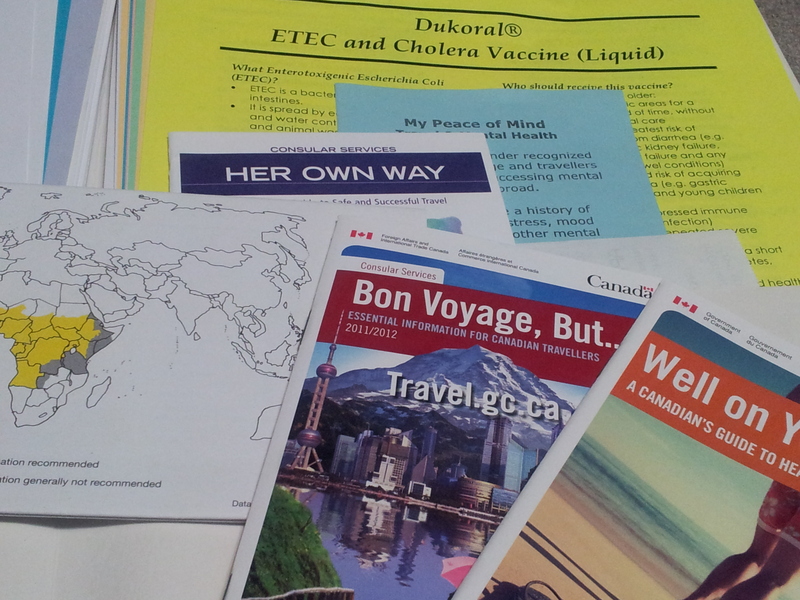 Know in advance what vaccinations and medications you need on your travels. Some countries won’t let you in if you don’t have your Yellow Fever vaccination and you probably want to carry medication from home so you know it’s not counterfeit. Some things to think about taking are anti-malarials, a general antibiotic in case you get sick, birth control, asthma inhalers, or diabetic and heart pills. If you’re unsure of what to carry on you, check out your local International Travel clinic and they can give you all the information you need. There are a lot of things to think about and prepare for when you’re going on a trip, and by making sure you have all of these things in place, you’re ensuring that you’re trip will go smoothly and there will be few problems to distract you from the amazing cities, beaches, and towns you might be visiting. If you’re planning on a shorter holiday, click here for some more things to think about before you leave, or if you’re going on a long term trip, here are some things to think about in advance.